Every week, I get to share some of my favorite recipes with you. And, on occasion, you guys return the favor and send me one of your favorites. Now, regrettably, I’m so busy that I don’t always get to make them all, but every now and then one really catches my eye and I just have to make it. 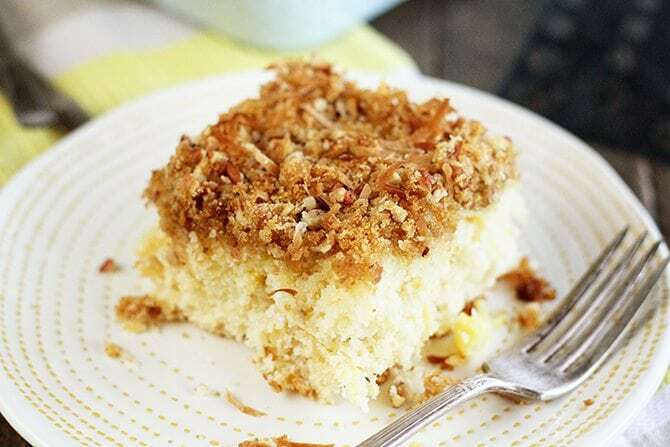 This Pineapple Cake with Coconut Crumb Topping is one of those recipes. JoAnn sent this recipe telling me that she just knew I would love it because of my affection for sheet cakes. And I do love me a sheet cake! 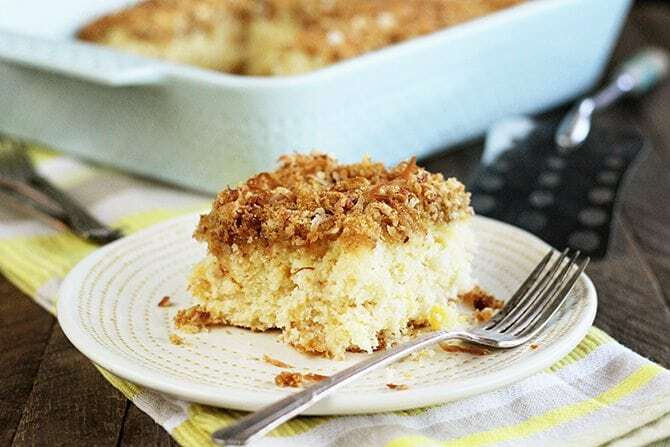 The cake has an amazing crumb (texture) and is studded with crushed pineapple. And while that’s incredible. It’s not the best part. Nope. The best part is the crumb topping. Yowzers! This cake doesn’t have a frosting like most. 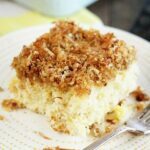 It’s topped with a crunchy, golden, delicious topping of chopped pecans, brown sugar, and coconut. The coconut toasts up perfectly for an amazing flavor and texture. It’s really the star of this dish. The topping combined with an amazing cake just makes this a show stopper. It’s perfect for your Easter table or plain ol’ Thursday supper. Regardless, you’re gonna love this one! Drain the pineapple in a mesh sieve or colander over a bowl so you can save the juice. In a medium bowl, whisk together the flour, baking powder, and baking soda. Add the melted butter, sugar, eggs, and reserved pineapple juice and mix well with a hand mixer (or in a stand mixer). Fold in the drained pineapple. Pour the batter into the prepared pan and spread evenly. 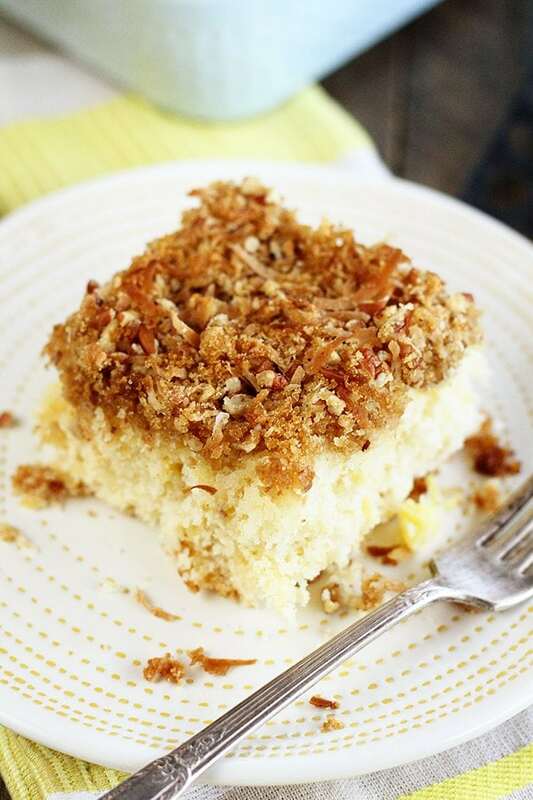 In a small bowl, combine the brown sugar, pecans, and coconut flakes. Sprinkle evenly over the batter. Bake for 30 to 35 minutes or unit the cake stars pulling away from the edges and a toothpick inserted into the center comes out clean. Serve warm. That looks simply amazing. Thank you for sharing. Thanks for the recipe-looks yummy! I have an off topic question. I find your website a tad difficult to read. The social media links appear to the left, pop ups from the bottom and this and than on the right. I have tried to shrink down the post but can’t seem to do that. This leaves literally an inch and a half at the bottom of the screen which allows me to read without obstruction. Is there another way you could place the social media links because they seem to be the worst hurdle. Thanks! Let’s definitely get this fixed! What type of device are you viewing the site on? Mobile, desktop, or laptop? I have also had this problem but it’s better now with the social media links going across the page. Thanks for fixing! Is it just as good served cooled? Or do you warm left overs? It’s fine at room temp, but I really prefer it warmed. I plan to make this using a yellow cake mix. Do you think it would be wise to follow the directions on the box and replace water with the pineapple juice, butter in place of oil and the same amount of eggs? Honestly, I am just afraid of all homemade because I’ve never made it before. The cake turned out great! The topping wasn’t as pretty as yours though, I will have to tweak that! So glad it turned out well for you!! Is there not a specific measurement on the juice? It could be different for many reasons or will it not be that big of a difference to effect the results of the cake? I am just thinking different brands of pineapple could yield different amounts of juice or the same brand each time could be different and I am assuming you are using crushed pineapple in juice and not heavy syrup? I always buy in syrup because I am a sugar lover! Thank you. No, there’s not an exact measurement. I tested 3 different brands and found them all to have almost the exact same amount of juice. That said, slight variations won’t greatly affect the outcome. Yep, it’s crushed pineapple in juice, just like the recipe mentions. 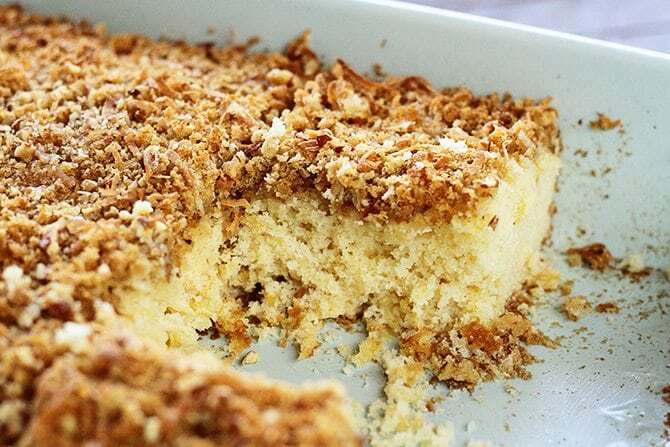 Hi..I want to make the same cake with fresh pineapple so please let me know how much to take and how much juice and how to prepare if for the cake. Also I dint have sweetened coconut shavings so whats the alternative? 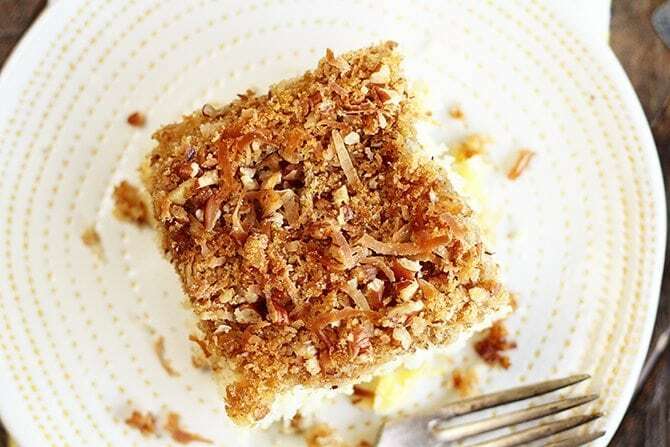 Should we use fresh coconut or dehydrated coconut flakes for this purpose? Being it’s a pineapple cake, other than the topping here, what frosting would you recommend for this type cake.